The start of the 2014 Inglis Australian Easter Yearling Sale is now just a week away and the pedigree updates keep flowing in. A considerable number of lots have received pedigree updates since the catalogue for the sale that stops the nation went online two months ago. Yearlings set to be offered at Newmarket on 8, 9 & 10 April include siblings to recent Group 1 winners Dissident, Able Friend, Snitzerland and Group 2 winning juveniles Mossfun, Zululand and Believe Yourself. Among the 555 lots catalogued for Easter are also yearlings from 167 stakes winning mares such as Criterion’s half-sister Silently – her second foal will be offered as Lot 211. 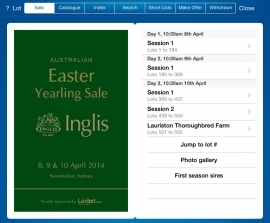 An Inglis Sales iPad App workshop will be held in the upstairs restaurant at Newmarket from 9:30am to 10:30am each day from this Thursday 3 April to Monday 7 April. Improvements to the app are constantly being made and everyone is welcome to come along and learn how the changes will assist iPad users. Inglis IT staff will be able to answer any questions you may have on the iPad application.